Nurses and staffers shout out to her and hug her. She owns the halls. Everyone wishes she didn’t have to be here, but they make her feel like she’s at home. 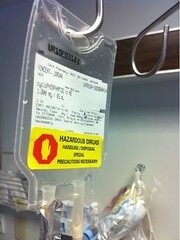 She’s hooked up to the IV and in a short while the chemical cocktail will be served. At the moment, she’s making her rounds and telling lively tales. Snacking while waiting for all the hydration and pre-drugs to take effect. Cytoxan can be hard on the kidneys, so Jordan is required to get plenty of fluid before the medicine can be administered. She is also given drugs to prevent nausea and a drug that coats her bladder prevent infection. Waiting. Jeanette and Jordan find ways to pass the time. The chemo process begins at 9am. She will not leave to go home until well after 5pm. Colorful accessories. 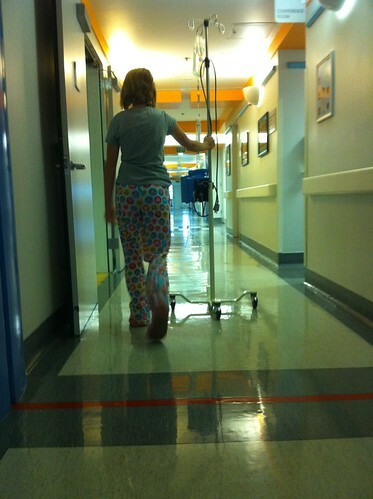 Jordan thinks that wearing pajamas out of the house is one of the few perks of chemo days. She also loves getting around in her pink slippers. For the love of Steve Jobs. The iPad she got for her birthday makes time connected to an IV more bearable. Jordan loves her tablet. Cytoxan After several hours of prepwork, the Cytoxan drip is finally started. It takes less than half an hour to administer, but requires 2-3 hours of hydration afterward to prevent tissue damage.